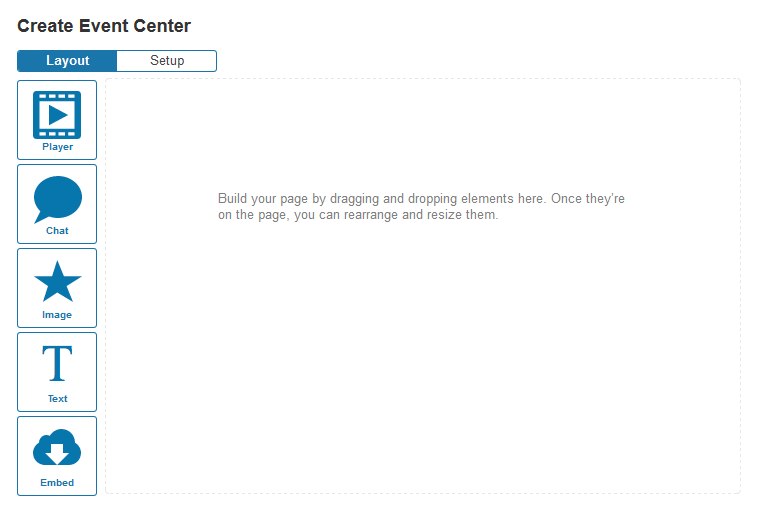 This article describes how to create a page in Event Center. Field59 customers can create individual pages featuring a live stream, videos, images, text, chat, and other content using Event Center. 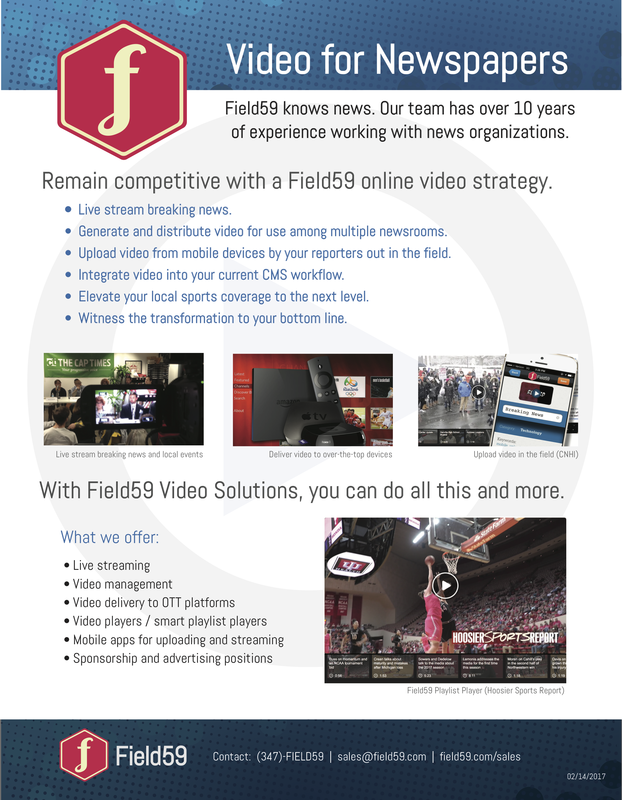 Think of it as a simple, modular content management tool to allow you to enhance your video/live stream content. To set up an Event Center page, your user must be a superuser. Log in and go to the Setup tab. Click on Event Center on the left. You will see a list of your existing Event Centers, or if your account does not have any, a prompt to create one. Select the orange New button at top right to create a new event center. Give your player a Title, which will display on the page above the player. Indicate which Type of Field59 asset (Event, Live Channel, Playlist, Video) is the content type that you will display in the player. It is important that you pick the right Type that matches the Key that you associate (for example, you can’t set a Playlist Type and then associate an Event asset Key). 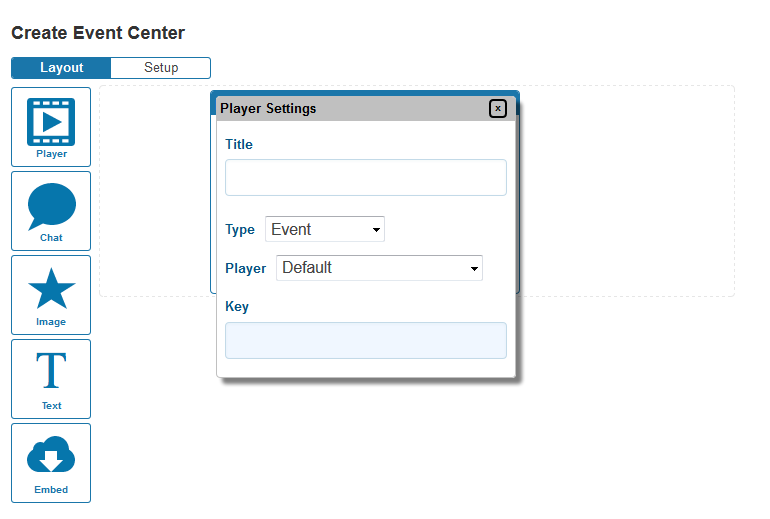 Select from your available Player configurations to apply custom player settings. Finally, paste in the Key for the asset you want to display (it may be helpful to have the Field59 manager open in a second Internet browser in order for you to quickly copy and paste the Key. We will add a search function to this in the future to improve this). Chat: You can add a chat element to your page. 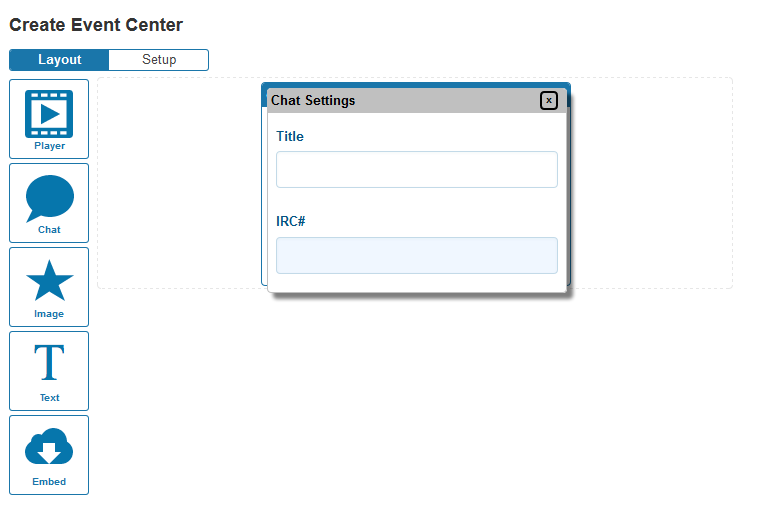 We have integrated a chat tool, http://webchat.ircnet.net/, that allows you to create a simple forum for remote event viewers to ask questions or communicate. Give your chat a Title, which display on the page. Under IRC# (IRC stands for Internet Relay Chat), define a unique hashtag for your event. This ensures that your chat channel is only used for your event. Image: Upload an image to your Event Center. The Use on Login screen check box allows you to set an image on the login screen if you have set a password for the page. 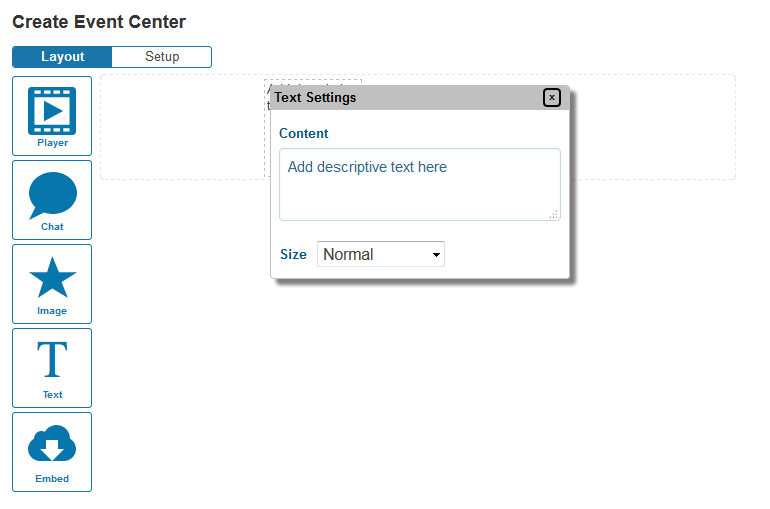 Text: This element allows you to add descriptive text anywhere on the Event Center page. You can also choose text size for a given text element. 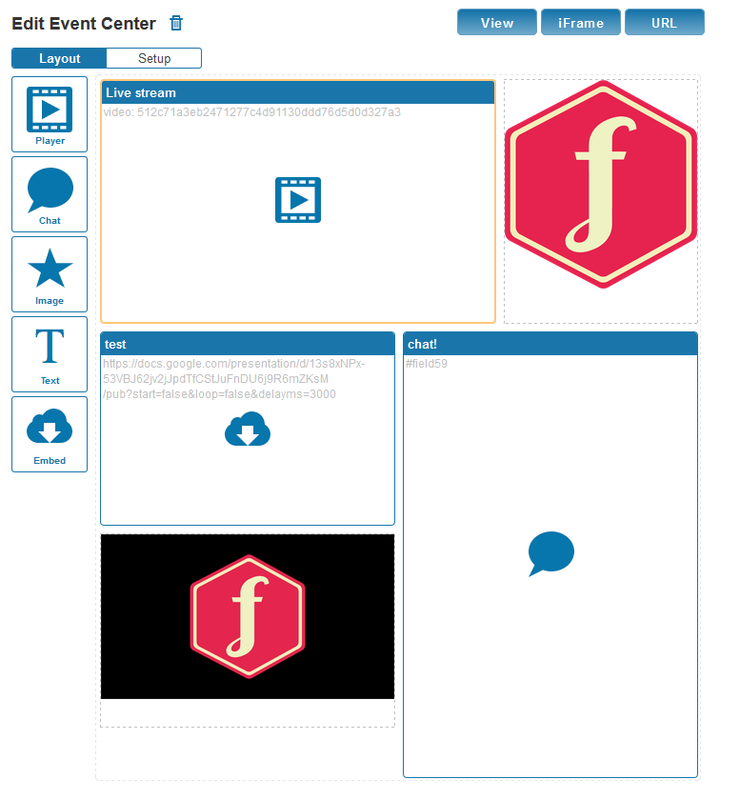 Embed: Finally, Embed allows you to iFrame in any additional elements to Event Center. The page will add <iframe> code around the URL you populate. This could be a URL to a slide presentation, or other information from another website. Please note that some websites do not allow iFramed content, so you will want to preview your Event Center page to ensure you can include the content. As you add more elements to your Event Center, you can arrange the order and size of all elements on the page. Single-click and drag on any element you’ve added to the page, to move it (or hit the delete key to remove it). Single-click and use the arrow tip in the lower right corner to make the element smaller or larger. (You can also double-click on any element to edit the element). Title: This sets the title of the page that will appear in your browser tab. Color: This sets the background color for elements on the Event Center page. Use Field59 footer: Unchecking this removes the “Powered by Field59” link that we place at the bottom of Event Center pages. URL: By default, all Event Center pages will have a URL that begins: http://player.field59.com/ec. The rest of the URL ends with your account, and then you are required to provide a custom URL path for your event. Require Login: If you would like to protect your Event Center page, you can set this here. Define a Password for your page and add a list of Allowed E-mail addresses that can access the page. Email domains only: Checking this allows you to set certain email domains that can access your Event Center page, without having to type in all of the individual emails. 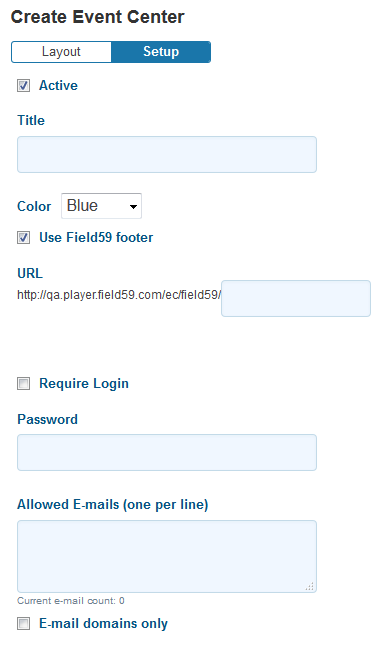 For example, to allow all users with “SomeEmail@field59.com” to access, you can just type in “field59.com”. You can set as many domains as you would like. User reports: If you have required a login and have defined email addresses/email domains that can log in, you can download a report of email addresses that accessed the page on a given day. Reports will only populate for days in which at least one viewer logged in. Finally, once you have configured all elements and settings, your Event Center is ready to go. There are 3 buttons at top right in Event Center: View, iFrame, and URL. View opens a preview of your Event Center page in a browser (you must be logged into as a Field59 Manager user to see this version). 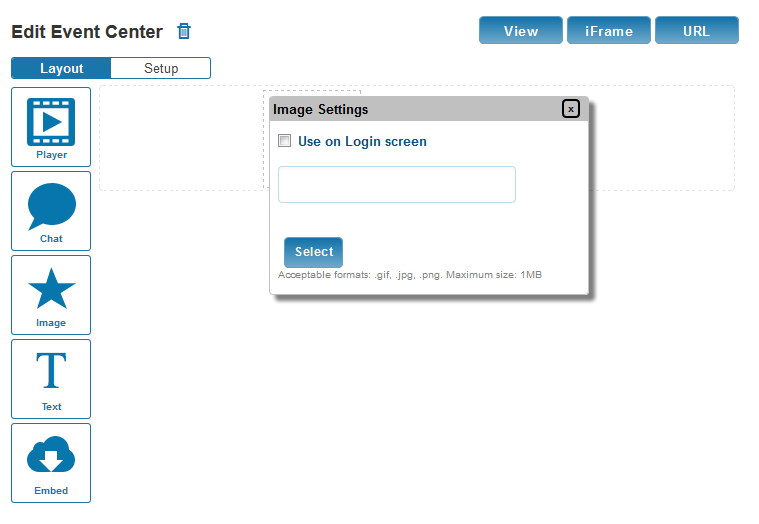 The iFrame button generates your Event Center in an iFrame code, so you can embed your Event Center on another website. The URL button allows you to copy the accessible URL for users (if you are not iFraming the page).